Once a year, beautiful palaces near Dresden Albrechtsberg Castle, Eckberg Castle and Lingner Palace, which are the main architectural feature in the final quarter of Dresden (Loschwitz), have become along with their beautiful parks in the fabulous cultural landscape hosts of the "Night of the palaces" on the northern slopes of the Elbe valley, a music and art scene of luring fans of cultural events with charm. Lingner Palace was built at the same time as Albrechtsberg by Prussian Prince Albrecht for his chamberlain Baron Von Stockhausen. That is why the palace is also known as Villa Stockhausen. 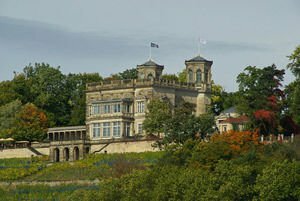 Lingner was being built in the years between 1850 and 1853 and Prince Albrecht stayed there until the requirements of Albrechtsberg mansion were completed, in 1854 Stockhausen Villa was built in classical style, and author of the architectural design is Adolph Lohse. Lingner Palace stands in the middle between two other palaces along the Elbe in Dresden. In 1906 the palace became the property of a legendary figure - Carl August Lingner, which had, by this time given the new name of the estate. Owner Lingner remains in history as an internationally recognized manufacturer of mouthwash "Odol". He is also the initiator of the first baby clinic in the world as a man dedicated philanthropist and founder of the Dresden Hygiene Museum. The manufacturer of the popular mouthwash, which is known all over Germany was an incredible genius of marketing and even tricked Giacomo Puccini to dedicate an ode to his mouth product. This discovery was able to provide him with big profits, given the elegance of the palace Lingner. Assets by used their discoverer for innovative solutions in his mansion. He ordered the construction of a ropeway from the palace to the bank of the Elbe. The palace itself was sounded by the music of incredibly expensive body which is heard throughout all rooms of the former Villa Stockhausen. The philanthropic kind of Karl August stayed after his death. In his will he donated Lingner Palace to the management of Dresden, the only condition that it not be sold and be constantly open for public visits. At present the park to Lingner Palace has one of the best beer gardens in Saxony, which has a beautiful view of the valley of the Elbe. Owner Lingner wrote in his will that the territory of his estate should always have a drink at an affordable price for everyone which is why today the Lingner Palace sells the cheapest lemonade in Dresden.